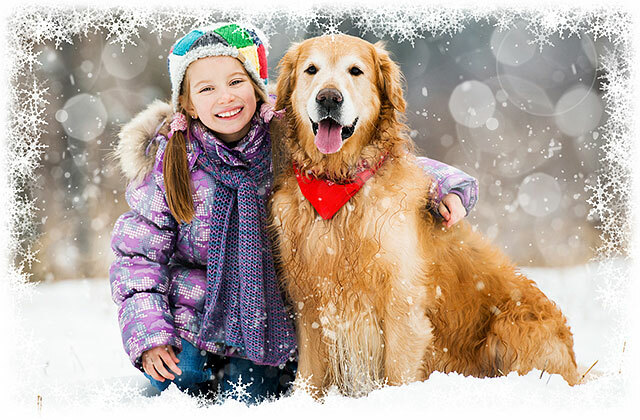 In this Photoshop tutorial, we’ll learn how to create a simple and fun snowflakes photo border, perfect as a finishing touch for photos of family and friends during the holidays or for any wintry scene. We'll start by creating our own custom snowflakes brush using one of Photoshop's built-in Custom Shapes and its powerful Brush options. Then, we'll create a selection for our border, turn the selection into a path, and have Photoshop paint along the path with our brush! As always, I cover every step along the way so anyone at any skill level can easily follow along. I'll be using Photoshop CS6 here but this tutorial is also fully compatible with Photoshop CC (Creative Cloud). For CS5 and earlier, you'll want to check out our original Snowflakes Photo Border tutorial. We'll start by creating our custom snowflake brush. Photoshop does ship with a ready-made snowflake brush that we could use, but the problem with it is that it's too small. Of course, we could always just increase our brush size, but once you go much beyond the default size of a brush, it starts to look soft and dull. Brushes are made of pixels, just like your photos, and as with photos, if we enlarge them too much they lose their sharpness. We want our border to look crisp and sharp so we'll create our own brush. Selecting the Custom Shape Tool. Clicking the shape preview thumbnail. Choosing the Nature shape set. Choose Append to add the Nature shapes in with the original default shapes. Choosing one of the three snowflake shapes by double-clicking on its thumbnail. Setting the Tool Mode option to Pixels. 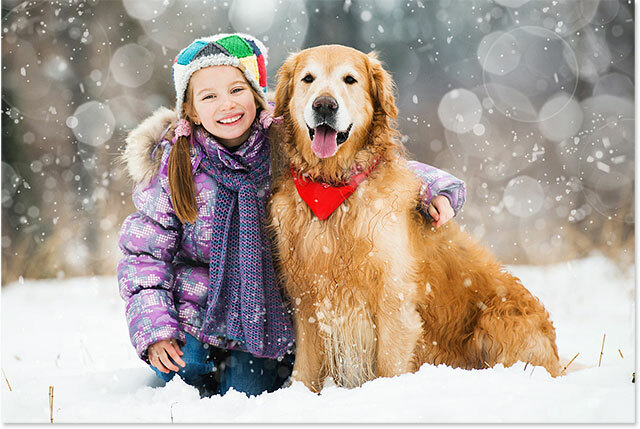 Even though the snowflakes we'll be adding around our photo will be white, we actually need to draw a black snowflake to create the brush. That's because Photoshop will use the black area as the shape of the brush, while the white area surrounding it will become transparent. Photoshop uses our current Foreground color as the brush color, so first we need to make sure the Foreground color is set to black. The easiest way to do that is to simply press the letter D on your keyboard. This instantly resets the Foreground and Background colors to their defaults ("D" for "Defaults"), making the Foreground color black (and the Background color white). The Foreground color swatch (upper left) should be filled with black. Press "D" on your keyboard if it isn't. With your snowflake shape selected and black as your Foreground color, click near the top left corner inside the document and drag diagonally downward to the bottom right corner. As you're dragging, press and hold the Shift key on your keyboard to force the shape into its proper aspect ratio so it doesn't end up looking all distorted. If you need to reposition the shape as you're drawing it to center it within the document, press and hold the spacebar on your keyboard, drag the shape into position with your mouse, then release your spacebar and continue dragging. Draw the largest snowflake shape possible within the document. Going to Edit > Define Brush Preset. Naming the new brush "Snowflake". Press and hold Alt (Win) / Option (Mac) and click the New Layer icon. Naming the new layer "Border". The Layers panel showing the new Border layer. Setting the Use option to White. Dragging out a rectangular selection for the photo inside the border. The photo is now visible inside the selected area. Going to Select > Transform Selection. Adjust the amount of blurring with the Radius slider. Larger images will need higher values. Smaller images, smaller values. The effect after blurring the edges of the border. Clicking the brush preview thumbnail in the Options Bar. Clicking the Brush panel toggle icon. Clicking on the words "Shape Dynamics" in the Brush panel. Setting Size Jitter and Angle Jitter to 100%. Clicking directly on the word "Scattering", then setting Scatter to 250%. Clicking directly on the word "Transfer", then setting Opacity Jitter to 75%. Clicking the Make Work Path From Selection icon. The new Work Path appears. The selection outline has been converted into a path. Lowering the brush size by dragging the Size slider. Clicking the Stroke Path With Brush icon. Scattered snowflakes with random sizes, angles and opacity values appear along the path. If you're not happy with the size of the snowflakes because they're either too large or too small, simply press Ctrl+Z (Win) / Command+Z (Mac) on your keyboard to undo your last step. This will remove the snowflakes you just added. Then, right-click (Win) / Control-click (Mac) anywhere inside the document to re-open the Brush Preset Picker and adjust the Size value as needed with the slider. Press Enter (Win) / Return (Mac) to close out of the Brush Preset Picker, then click once again on the Stroke Path With Brush icon in the Paths panel to try again with your new brush size. Click in the empty gray area to hide the path from view. You'll need to turn the Work Path back on before adding more snowflakes. And there we have it! 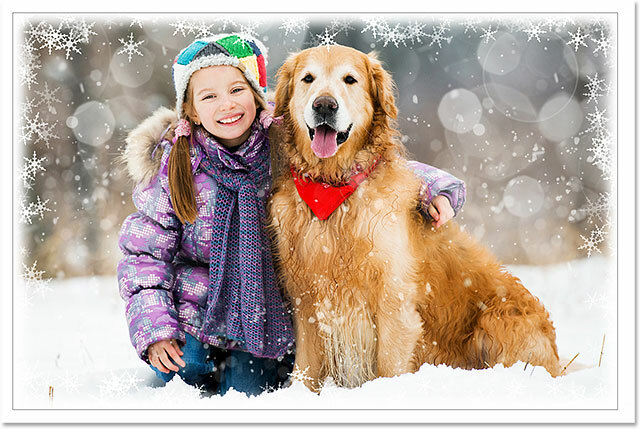 That's how to surround a wintry scene with a fun snowflakes photo border using Photoshop CS6 and CC (Creative Cloud)! Visit our Photo Effects section for more Photoshop effects tutorials!